I am sure we have all asked ourselves - how does caffeine work? I think that in order to understand a lot about caffeine and how it affects us , we need to know how it works. 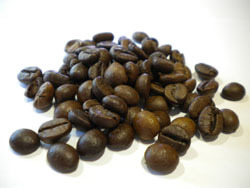 Caffeine: Is a stimulant which temporarily improves either our mental or physical performance or both. For example, it may make you more alert and energetic. Adenosine: Is a brain chemical that stops the release of dopamine and adrenaline which are natural stimulants. You could say that when a lot of adenosine is released, it causes us to become sleepy. Dopamine: The body makes adrenalin from dopamine. Adrenalin: Is a hormone that is released in our body when we are under stress in order to prepare us for exertion – the flight or fight syndrome. It is a well known fact that caffeine gives us a mental and physical boost. It does this by blocking the body’s receptors for adenosine (see explanation above). What happens is that caffeine (which is a stimulant) blocks the receptors for adenosine – you could say that it stops adenosine from being released. The result of less adenosine activity is that the levels of dopamine and adrenalin increase which leaves us feeling more alert and motivated. The bad thing is that the more caffeine we consume, the more insensitive our body and brain becomes to our natural stimulants and we need more of it to make us feel normal again…and so a nasty cycle begins because as we drink more and more caffeine to feel normal, we keep pushing our bodes to produce more and more of our natural stimulants which eventually leads to adrenal exhaustion. Our body then can’t produce these important natural motivational stimulants (dopamine and adrenalin) - which leaves us feeling depressed, exhausted and unable to cope with life. The effects of caffeine reach their peak 30 – 60 minutes after consumption, after which it is broken down by the liver. Half its peak level is left after about 5 hours, which means that I drank 200mg of caffeine (found in 1 large cup of coffee) at 5pm then at 10pm there will still be 100mg of caffeine left in my system blocking adenosine reception. As we have seen, dopamine is necessary for us to sleep and since caffeine reduces dopamine in our body, the result is that we may fall asleep, but we will be robbed of the deep meaningful sleep that we need. We will then wake up feeling tired which would probably make us want to drink more coffee. This begins a cycle and a lot of people in this cycle report headaches and a feeling of being tired and depressed. I hope this explanation answers your question - how does caffeine work?" This is a very basic explanation of what happens in the body, but it is easy to understand and that is what matters most..